We present here the complete album of the Cyprus league of the season 2015/2016. The collection has been published by Panini, as usual in the latest years. The album of this season has been renovated with new graphics and more stickers starting from a stylish cover. However, it does not reach the standard of the usual Panini albums, as the paper used is very thin. The album includes the 14 teams of First Division. Each team is displaced over four pages with a total of 23 stickers: the team photo (two stickers) and 21 players. The second part of the album includes two sections. The first one is "I Love this Game" with 40 stickers that show game actions over four pages of the album. On the stickers and on the album there is no description of the games or the players in action. This feels a too large section and it is a pity that club badges were not included. 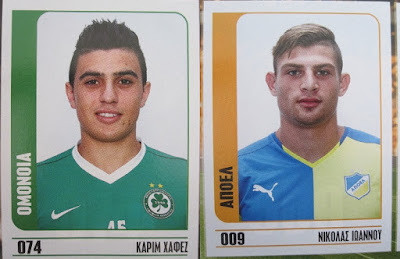 The last section is "PASP Football Award 2014/15", with 12 stickers of awarded players and coach on one page. These are special shining stickers with a great design that increase the collection value at last. Nicolas Ioannou (1995, APOEL), Christos Wheeler and Charis Kyriakou (1997 and 1995, Apollon), Karim Hafez (1996, Omonia), Giorgi Aburjania, Efthymios Koulouris, and Andreas Makris (1995, 1996, and 1995, Anorthosis), Moustapha Quaynor and Leandros Lillis (1995 and 1996, Ermis), Antonis Katsiaris and Marios Elia (both 1996, Ethnikos Ahnas), Antonis Mahattou and Ilias Georghiou (1998 and 1997, Ayia Napa), Eric Leontiou and Richard Emmanuel Edimo (1997 and 1995, Doxa Katokopia), Symeon Kittos, Antonis Koumis, Loizos Kosma, and Panayiotis Hadjiandreas (1996, 1997, 1995, and 1997 EN Paralimni), Panayiotis Zachariou, Hervé Bodiong, and Thomas Ioannou (1996, 1997, and 1995, Paphos), Kyriakos Panagi (1996, Aris).